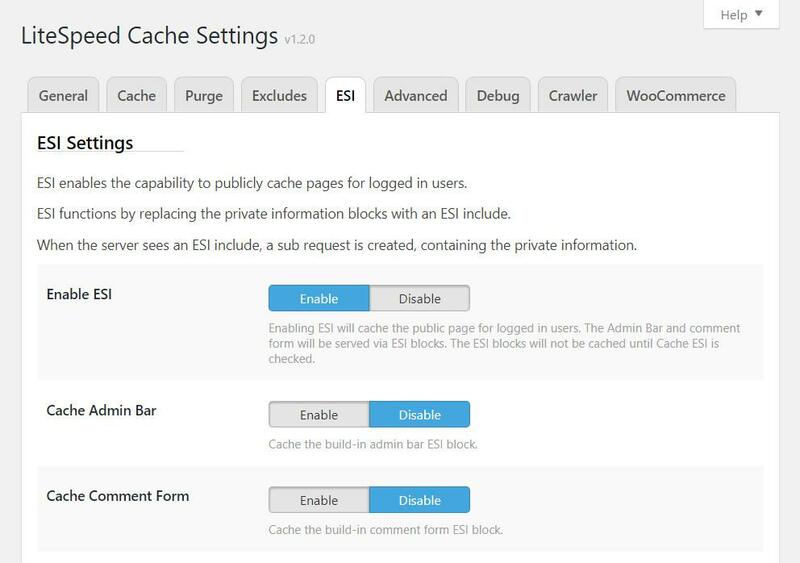 As you may know, we recently released a new version of our LiteSpeed Cache for WordPress plugin, and we now support Edge Side Includes, also known as ESI. Today we are going to talk about why this is such awesome news for your website. ESI is a markup language that allows you to designate parts of your dynamic page as separate fragments that are then assembled together to make the whole page. To put it more quaintly, ESI lets you “punch holes” in a publicly-cached page, and then fill those holes with privately-cached content. Technically, it could be the other way around, too (publicly-cached holes in a privately-cached page). The point is, with ESI, punched holes can be treated differently than the rest of the page. They can have different TTLs and be purged by events that are completely separate from the page they are on. This allows you to cache more of your site for more of your visitors. 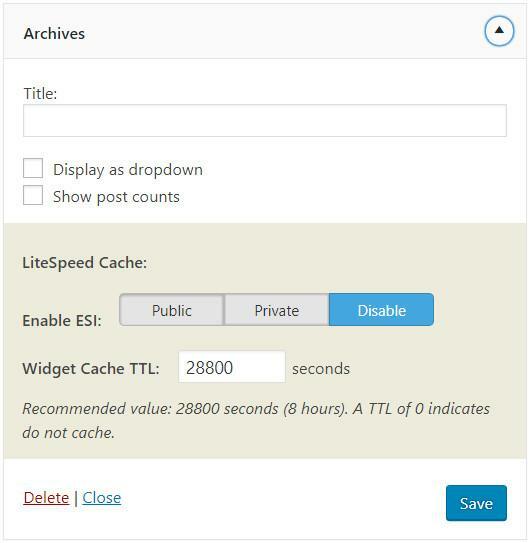 LiteSpeed Cache is tag-based (which means that each page is stored with an identifier that allows it to be purged from cache as part of a specific subset) and has built-in public and private caches. In the public cache you will find pages that are exactly the same for everyone. 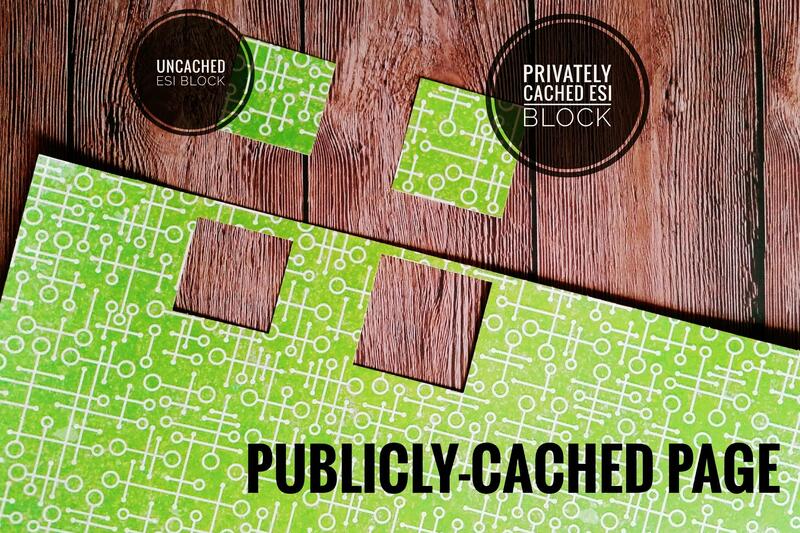 Private caches contain content that pertains only to a specific user specified by his/her IP address and session ID. Until now, you’ve had to think about your site’s pages in their entirety. Is this page publicly-cacheable? Is that one publicly-cacheable? If a page had any private data on it at all, you’d have to say “no, it cannot be stored in the public cache.” This issue of having to cache a full page in its entirety is why our WordPress plugin until recently only cached pages for non-logged-in users. In WordPress, non-logged-in users are almost always served only public content. And in the few cases where they are not (password-protected posts, moderated comments, etc. ), that content is usually considered non-cacheable for that user. ESI changes this. Let’s look at a few common scenarios and see how they play out with ESI enabled and without ESI. You’re the site admin, you are logged in, and you visit your site’s home page, which is in the public cache. Without ESI: your request hits the backend, because the admin bar at the top of the page is private content, and as such this page (and every other page on your site, for that matter) cannot be served to you from cache. With ESI: most of the this page is served to you from the public cache, while the admin bar is served to you from your private cache. There is no need to invoke PHP. You have a large site with much static content that rarely changes. Every page has a sidebar, and the sidebar widget “Recent Posts” appears on each page. With ESI: All of the pages in the site can remain cached with a nice long TTL, while the Recent Posts widget is the only thing that needs to be purged. Re-populating that one bit of the cache requires just one visitor to request any page one time. You can see how ESI + LSCache can have huge implications for the speed of your site! Note: ESI doesn’t come without a cost. It is much simpler for the server to return fully-cached pages than it is for it to piece together pages from several different blocks (although it’s still more efficient than invoking PHP would be), and so this must be a factor in your decision to enable ESI. Will the speed benefits outweigh the efficiency hit? It depends on your site, really, and it may require some experimentation on your part. 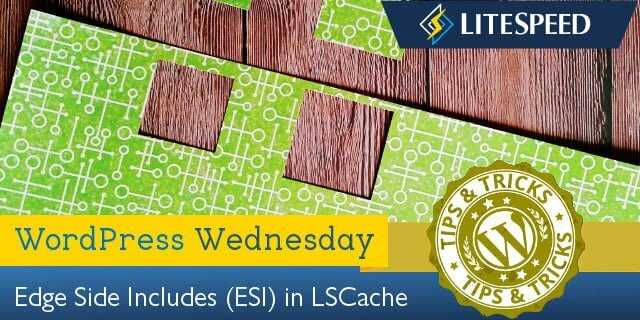 Navigate to WP Admin > LiteSpeed Cache > Settings > ESI Settings. Set Enable ESI to Enable. Set Enable ESI to Private. Set Enable ESI to Public. Set Widget Cache TTL to 0. A bbPress page contains so many areas of private data, that it’s actually much more efficient to consider the entire page to be private. So, that’s what we’ve done. All bbPress pages are considered private. As everyone begins to use ESI in their LSCache-powered WordPress sites, undoubtedly more special situations involving third-party plugins will present themselves. If one of your favorite plugins warrants special consideration, we encourage you to get in touch with us via the WordPress plugin support forum and tell us about it. So what do you think? Would you like to give ESI a try on your site? Upgrade to the latest version of the plugin and you’re ready to get started. P.S. Want to know more technical details about ESI? Check out the official specs. Hi. Do you have any example of code how can I implement esi, private and public caches on the site without CMS? You can find some information about setting up various caching scenarios through rewrite rules here. For ESI, specifically, see this wiki. Please let us know if there is anything you need to know that is not covered in our documentation! Playing around with this a bit more…is this really needed for something like a recent post widget if you only post once every day or two? Or does WordPress dynamically “rebuild” the widget every time the page is loaded, checking each time for the latest posts — in which case I could see this being very helpful. If your page were completely uncached, then WordPress would rebuild the widget every time the page is loaded. If your page were cached without ESI, then the widget would only be rebuilt the one time that the page is dynamically created before being cached. So, if your page had a TTL of one week, then the widget would be regenerated only once per week. With ESI enabled, you can configure the widget to be uncached (so it is rebuilt with every page load), or give it a different TTL (so it is rebuilt more or less frequently than the rest of the page). Whether or not ESI is necessary for a recent posts widget depends on how frequently you post, your site’s TTL, and how OK you are with the possibility the widget’s content may sometimes be stale. If you post once per day, and your site’s TTL is set for 24 hours, and you don’t mind your widget being slightly behind the times now and then, then ESI would not be necessary in your case. I’m not having much luck getting this to work. How would I use an esi block with the above code to not cache the shortcode output. Is there mark up I can put in my theme to create ESI blocks? this is specifically so I can create an ESI block for my custom theme ajax cart. We have an API with some ESI functions that you may find helpful. The API is here. And some ESI examples are here. About your performance note, do you mean having multiple ESI blocks may be slower compared to be executed dynamically by PHP? Have you made some test to see the average response time of ESI block? How many ESI blocks are too much? No, I mean that multiple ESI blocks may be slower compared to whole-page caching. I’ll update the blog post to be more clear. Thanks for asking! As far as how many ESI blocks are too many ESI blocks? It’s not an easy question to answer, as it varies considerably depending on your system resources. I wish I could be more specific! I would start with a widget or two, and see how it goes. This is great, thanks for the update. One question on applying this properly, here’s my situation. I don’t use the recent posts or recent comments widget but I do have a featured content widget. I’d like to set it to return a random selection of posts from one category. So for example, show 5 posts out of a possible 20. This means every page is different (at least in terms of this widget) every time it is loaded. Should I set this widget as public ESI? Will that allow the rest of the page (that doesn’t change) to be cached or does that already happen without ESI enabled? I also have a social media counter in a widget that updates every 8 hours…I’m assuming that could be handled the same way? These are perfect cases for ESI widgets. For the social media counter, you can turn on Public ESI and give it a TTL around 8 hours. For the featured content widget, you can turn on Public ESI, and give it a very short TTL, say, 5 minutes. You could also set it to be uncached, but I wouldn’t do that unless it is crucial for the widget to show new content with every page load. You get better performance if you cache it, even for a very short TTL. I hope this helps. Let us know if you have any other questions! Would ESI be useful here at all (if that’s even possible)? I have a large number of category pages. If that is a basic WordPress archive page of anything with a label of “costco,” then it should already be purged from the cache any time a new post labeled “costco” is published (or modified). You can configure this behavior in the Purge tab of the settings. ESI wouldn’t be necessary here, because it’s really the whole page that is changing when there’s new content. Ah yes, that makes sense, thank you!